Heat half the milk to a temperature of 95-104°F. Add sugar, salt, yeast, and yolks of egg (place separated whites in refrigerator), and mix well to a smooth consistency. Then add 2 tablespoons butter and mix again. Cover the batter and leave to stand in a warm place for 3-4 hours, during which period it should be stirred several times. Finally add the rest of the milk (also heated) and stir rapidly. Whip the cooled egg whites and fold into batter. 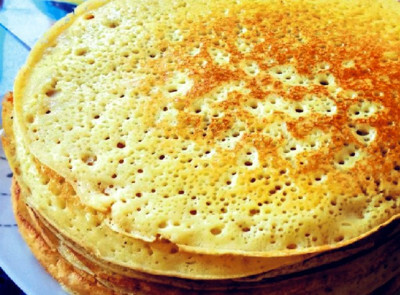 Fry pancakes on both sides in a well-heated heavy frying pan. Spread with butter and pile up on a plate as they are done. Serve pancakes with red or black caviare, any kind of salmon, any kind of smoked fish, herring, sour cream, milk or jam.